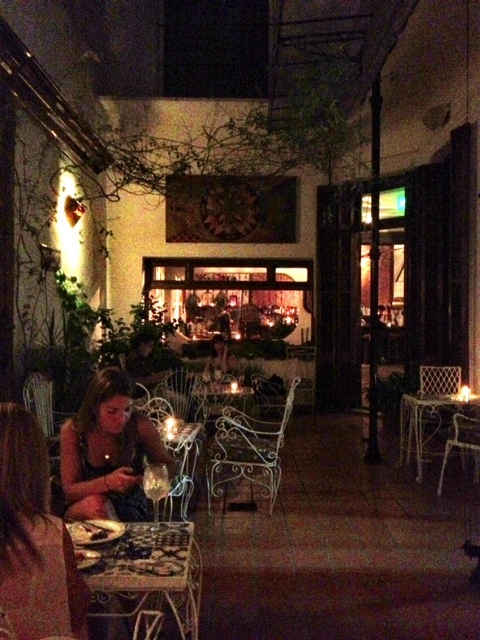 I’m a sucker for a great cocktail lounge and having read about the new Rey de Copas (King of Cocktails) in Palermo Soho, I knew I had to check it out. The plan was to initially go to another newish hot spot Aipim for dinner then head over to Rey de Copas. Unfortunately, I was victim once again to the summer schedule and the restaurant was closed. I had read that Rey de Copas had a small but supposedly excellent bar menu so decided to do both dinner and drinks. 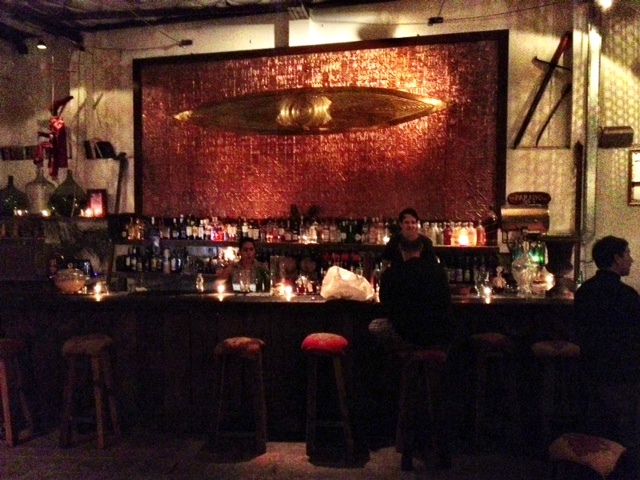 The lounge was located on a quiet part of Gorriti, a street that is home to many top bars in the area. It was a bit after 9PM so pretty early for cocktails but it was apparently Ladies Night (no legal issues here I guess for that) so there were already some people there. Most were hanging out in the patio section so I selected a table there. Amazingly, the table was both fairly high and had the blessed padding underneath it so I was very pleased, particularly given that I had walked about 2 miles in very hot, sticky weather to get there. 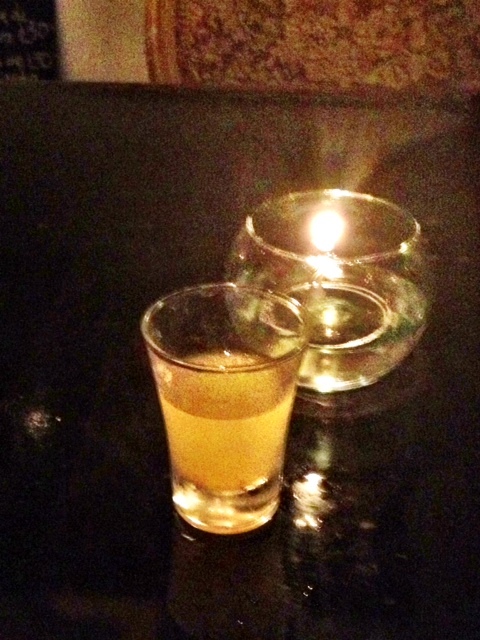 I knew I was in good hands when I was presented a shot of their fruit rum punch as a welcome. The cocktail menu was massive, with a lot of very interesting drinks, including 8 different variations on gin and tonic, and 7 different types of juleps. 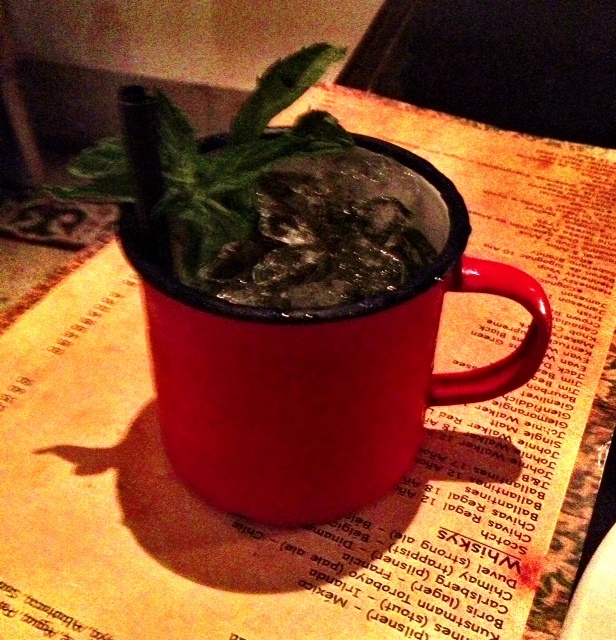 Since it was so hot, a julep sounded like the way to go. Since this was clearly a local place, there was no English menu and I had to work with my server a bit to interpret some of the items on the menu. Finally, I just asked her which julep she liked and she told me to go for the Marrakesh Julep, which had 20 year old aged rum, spiced simple syrup, mint, black sugar and lime juice. 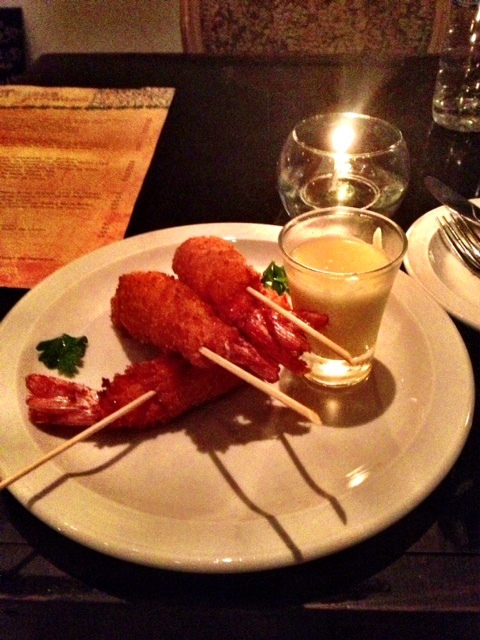 I once again relied on my server to suggest a couple of the tapas style dishes from the small food menu. She recommended the chicken skewers and the shrimp tapas. Sounded good to me. 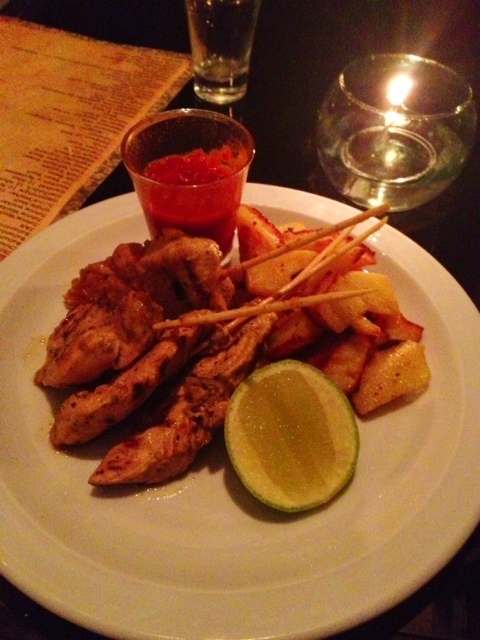 The chicken skewers came out first paired with some delicious patatas bravas. However, since that contains garlic, they graciously put the sauce on the side. The citrus marinade was superb and the chicken was perfectly cooked, moist and juicy with nice wood grilled charring. They went surprisingly well with the slightly spicy julep. Next came the shrimp. I had no idea what to expect but these were delicious too, very large prawns, lightly fried with Panko crumbs and just a pinch or two of salt. Given that it was a school night, only one more cocktail would be imbibed so I turned to my handy server to recommend the one drink she has above all others there. She eagerly said that would be the Amada. From the extensive and intriguing list of ingredients, it seemed like a great choice. 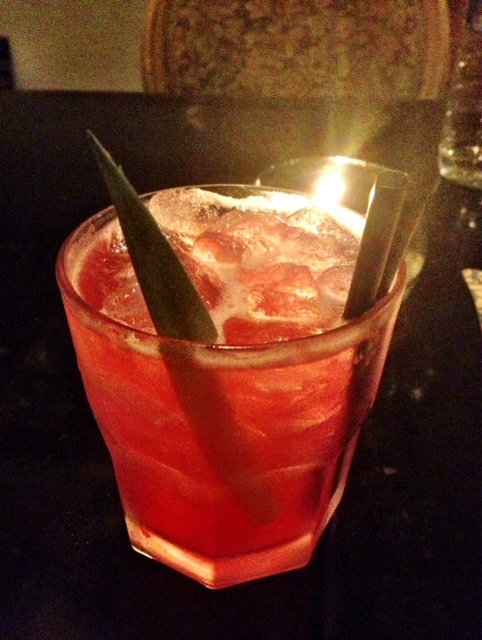 The Amada consisted of: Ginger infused vodka, aged rum, Campari, pineapple, grapefruit, lime, spiced simple syrup, Ricard Pernod and lemongrass – whew! This was one seriously complex cocktail, with a mixture of sweet, sour and bitter combined to somehow work together. Each sip had different elements to it but overall very thirst quenching, which was certainly appreciated given the hot weather. I plan to come back here before I leave to try other cocktails that looked very intriguing, including at least one that uses what they call the “perfume” of various scents – which is achieved by burning that scent next to the cocktail. Perhaps a bit much but when cocktails are this clever and delicious, I’ll let it slide. Posted on January 24, 2013 by reyalto. Bookmark the permalink.